Among our holdings in the Houston Hip Hop collections are items related to the late rapper Big Mello (Curtis Davis), best known for his early nineties Rap-a-Lot releases Bone Hard Zaggin and Wegonefunkwichamind. A particularly versatile rapper, Big Mello’s output ranged from funky gangsta rap to fast spitting exploits to smooth R&B. Raised in the Hiram Clarke neighborhood of Houston’s Southside, Big Mello was one of the first to celebrate the city’s custom car culture in his music. 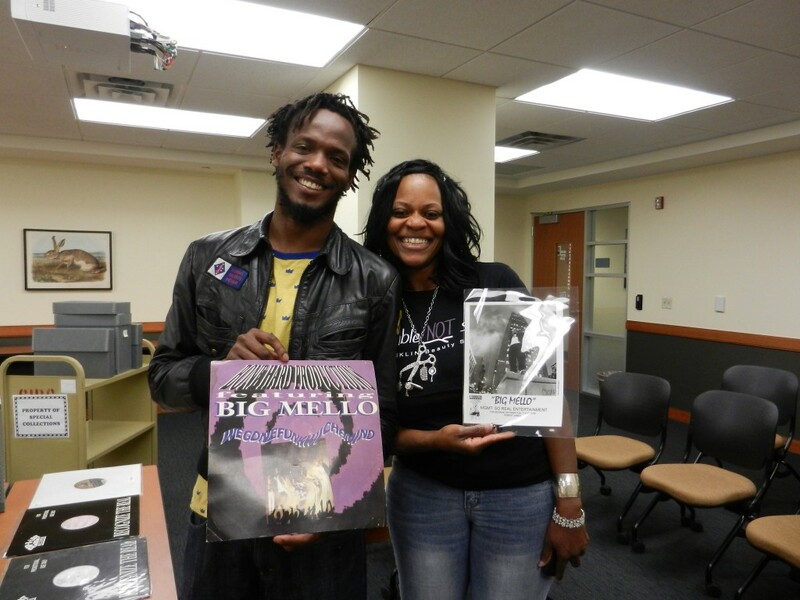 Last week, Big Mello’s son Andrew Davis and his sister Tammy Davis visited to view rare 12″ records and promotional materials of Big Mello’s that had been acquired through the collections of other artists. Ms. Davis recounted her brother’s love of music which stemmed from his childhood and was still burning bright at the time of his death in 2002 from a car accident. That passion has been passed down to son Andrew, who records as The Aspiring Me. The newest digital collection of Special Collections materials features a binder’s collection of sheet music dating to the late 18th and early 19th centuries. 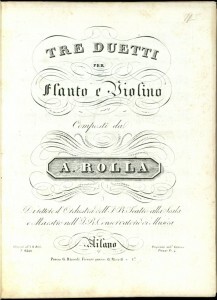 Sheet Music of Flute and Violin Duets, 1790s-1850s features a binder’s collection containing 27 duets for flute and violin. Binder’s collections of sheet music were common in the 19th and early 20th centuries, providing the means to social entertainment in homes and other informal settings beyond concert venues. While often unorganized, some collections are ordered according to genre, instrumentation, composer or chronology. The works of a number of composers are included in the collection, including composer and flautist François Devienne. Other composers include Friedrich Ludwig Dulon, Franz Alexander Pössinger, and Eugène Walckiers. 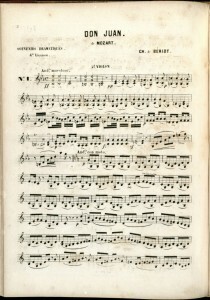 The sheet music also includes operatic transcriptions arranged by violinist Charles de Bériot, including a selection from Don Juan by Wolfgang Amadeus Mozart. While the printed music is bound in two separate volumes, one for each instrument, the pieces have been combined in the digital collection so that both parts can be seen together. Music lovers and anyone interested in this unique collection should spend some time with the digital collection, or visit Special Collections to see the original volumes. Captain O.C. McDavid was a journalist, an artist, and, like so many of the young men of his time and age, a soldier. 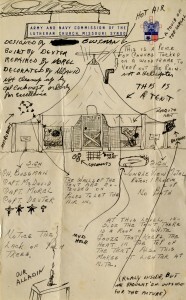 Special Collections holds a collection of his personal correspondence covering the breadth of his service during World War II, and a finding aid is now available online. Captain McDavid served much of World War II stationed in the South Pacific, supporting the Allied cause by helping to establish village governments with local populations and building infrastructure to support sanitation, security, and healthcare. As with most correspondence from the war, censorship of operations and engagements with Axis forces provide scant details for those interested in the minutiae of South Pacific strategy. Instead, what emerges in these letters has as much to do with McDavid’s observations of foreign cultures as it has to do with the struggle for the South Pacific. 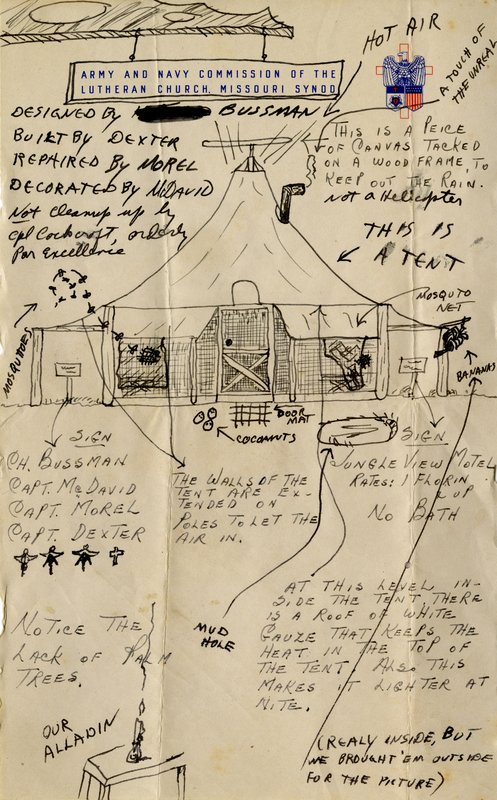 Of particular note, given Captain McDavid’s later career and work as an artist, are the comic and compelling illustrations and sketches he uses to embellish so many of the letters back home. As Allied troops sought out and clashed with Axis forces, McDavid’s words and pictures show us American G.I.s and their Australian allies working, living, and sharing with native New Guineans. All of this is set against the backdrop of the realities of war, evenings peppered with what McDavid describes as “The sharp staccato spitting of a machine gun. The throaty hacking of a BAR,” as he and his fellow soldiers wonder at what lurks beyond the palms in the darkness. Those interested in McDavid’s career as an artist and journalist will no doubt enjoy these glimpses into his formative years, while those with interest in the Pacific Theatre of World War II may be interested to look into the particulars of his work and time spent in New Guinea. We encourage you to explore the finding aid for more information and visit us if you are interested in studying this collection. The latest exhibit featuring materials from Special Collections opens today in the M.D. Anderson Library. 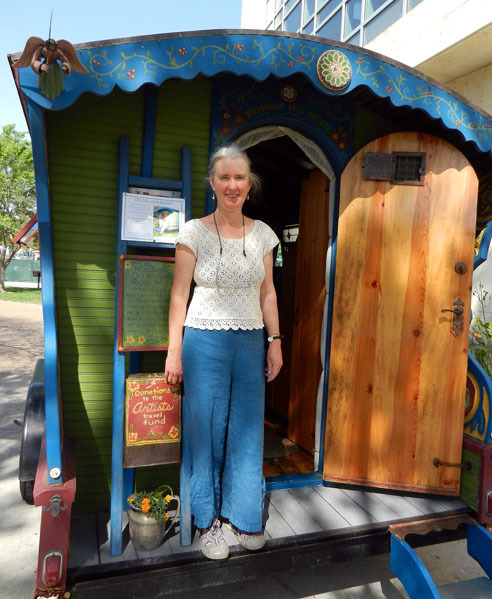 Houston’s Environmental Past highlights the work of Houston environmental activists across four themes — Floodplain/watershed management, wilderness recreation, green space protection, and urban planning. While exploring Houston’s environmental past, the history of Houston’s infrastructure and business development is also addressed. The exhibit is open to the public during the library’s regular operating hours and runs from March 25 through September 20. You can find it on the first floor, between the red and brown elevators. For more information, contact Dr. Teresa (Terry) Tomkins-Walsh. 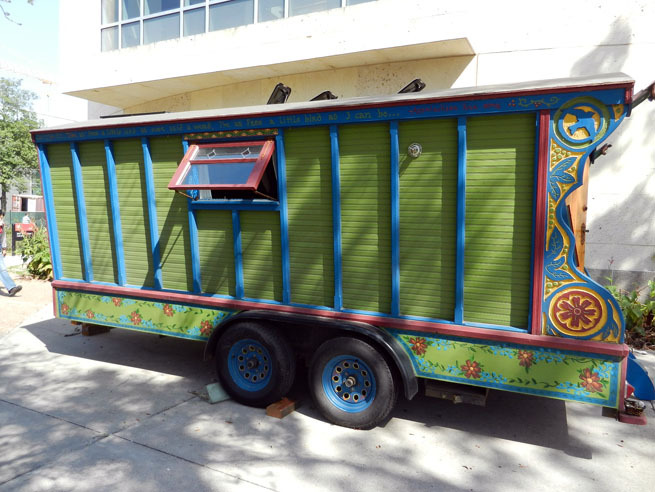 Wandering Book Artists Donna and Peter Thomas visited the University of Houston Libraries today for a lecture, meet and greet, and tours of their Gypsy Wagon Bookmobile. The artists, who have been making artists’ books together for more than 30 years, entertained and educated those in attendance with stories, songs and demonstrations of their many handmade books, including miniature books, books made of wood, and books made with unusual items, including a can, a ukulele, and an accordion. 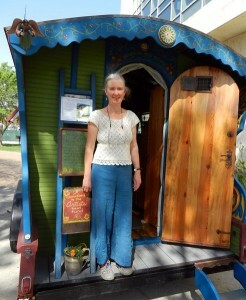 They also answered questions about their creative process and the craft of bookmaking. Attendees were also able to get a look at the Gypsy Wagon Bookmobile that the Thomases use as they travel across the country. 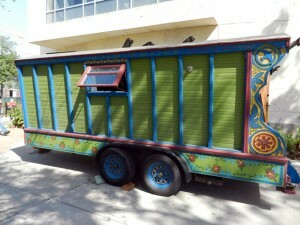 The bookmobile, built on a 16-foot flat bed trailer, provides a place to sleep, dine, and conduct business. Influenced by vintage pictures, it is painted in bright bold colors and uses reclaimed wood, wrought iron, and stained glass. 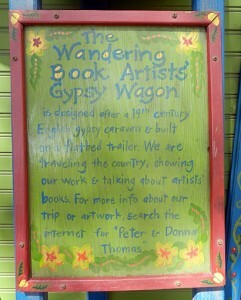 For more information about the Thomas’s books and wagon, visit their blog and website. To experience a Peter and Donna Thomas book yourself, come to the Special Collections reading room and ask to view Cannery row: A book in a tin or one of these titles.